When it comes to cleaning, one of the biggest questions cat owners have is how to get rid of cat urine smells after a kitty has been behaving badly. You may have already “fixed” the cause of the issue, i.e. you’ve stopped your cat from urinating, or the offending feline is no longer there. The problem is…it doesn’t end there. The reminder of the offense (the potent urine smell) still lingers though. What’s worse, is it can be virtually anywhere in your home, especially when it comes to fabric. Unfortunately, cats tend to pee on things like carpet, rugs, furniture, and clothing. The strength of the smell in these items isn’t just noticeable when you’re close to these items…the entire room tells the story of cat missing the cat box, having an accident or marking its territory. Cleaning cat urine odor from your home can be easy or difficult. It all depends on how deeply the urine has penetrated. Also, how many places have been victimized if your cat has urinated in multiple spots within your living environment And of course, it depends on how many other odors are around to help mask the cat pee odor. Whatever the case may be, if you’re facing this odorous issue, you need to learn how to clean up cat pee correctly. Plain and simple. Besides being annoying and unpleasant, this potent smell can be extremely bothersome to highly sensitive people and can be a big turn off to visitors, other pets and, of course, prospective buyers if you’re selling your home. In this article, we’ll take a look at your best solution: using an enzymatic cleaner for cat urine smells and stains. May cat owners have used these cleaners to get rid of cat urine smells, but are they all created equal? For the most part, yes. Let’s carefully review one very popular and trusted enzyme cleaner and learn how it can help resolve your smelly problem for you and your nose! One of the biggest mistakes cat owners make when it comes to cleaning up cat pee is trying too hard. We’d all like to think that this stuff is like any other stain in that, once you wash it down with some water, soap and/or disinfectant, will go away. In the case of cat urine removal, you’re usually disappointed afterward when you discover that the smell is only lessened (not removed), in a best case scenario. What happens is you try to “absorb” the stain and odor by diluting it and then washing or mopping it up; but, what you end up doing is cleaning and disinfecting the surfaces only. Worse yet, wetting down the area can often “reactivate” old cat urine crystals and make them larger (as if you were to soak a Cheerio in some water), making the smell stronger than ever. In other words, adding water and re-hydrating the uric acid in kitty urine is the last thing you want to do! Unfortunately, this is what happen if you try and steam clean the area, such as with a professional carpet cleaner. Today, the most effective way to tackle cat pee odor is organically. In this case, it’s organic matter eating bacteria in the form of odor dissolving enzymes. As mentioned above, water and disinfectants give you results ranging from “lessening” the intensity of the smell to actually making it stronger. You need a solution that literally attacks the odor causing compounds in the substance that is causing the odor. The attackers in this sense are called enzymes and “good” bacteria. With the right product, these enzymes and bacteria actually feed on cat urine’s odor sources (uric acid) and digest them completely. What’s left is no more cat urine odor, and in most cases, no more stain. One such highly effective product is Rocco & Roxie’s brand. It contains completely natural, Ph-balanced mixtures that are totally safe for humans and pets. With this product, if you have an excessive amount of odor or staining, feel free to do a couple applications. The second time around can really make a difference on tough spots. 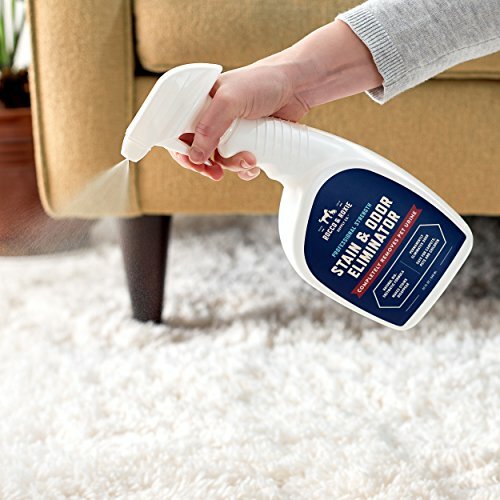 Depending on your needs, they make an all-purpose formula, as well as one for carpets and one for laundry (nothing is worse than cat pee smell in your clothes or bed linens!). By the way, there are lots of other natural solutions out there. But what makes the best enzymatic cleaner for cat urine? The one that works, right? The brand highlighted here is just so easy to use, and is usually the least expensive. ***It’s recommended to buy these in bulk if you can, since the stuff will last…and it works, so you’ll always want to have some on hand, even for problems other than removing cat urine smells! If you need to clean cat pee from a couch or chair, it’s possible the stuffing or cushion under the outer cover was penetrated. If you suspect this, have no fear. You just need to saturate the area of your couch to the point that the liquid flows through underneath. As long as the enzymes can make it to this”food source”, they can work their magic. If you’re able to unzip your couch cover, then you’ll be able to access the foam or stuffed cushion underneath more easily. This is definitely recommended for best cleaning results. For cleaning cat pee from carpet, the same principle applies. Soak the area and at least six inches out from where you detect the staining. Since liquid can travel beyond what you might see, you want to be sure to get the enzyme cleaner beyond the spot you’re treating. If possible, pull back the carpet in corners or along the wall to get at the carpet pad underneath. Some people don’t want to spend the money on a product and invest in the most effective method for how to clean up cat pee. Even if it’s not full of chemicals like the enzymatic cat urine cleaner mentioned above, they insist there are other all-natural ways to go about it, that don’t cost anything. Let it be said that these remedies will only help you, and not fix the problem permanently like an enzymatic cleaner can. Saving money is always a concern, but this is one time you’ll be thankful for cleaner home. Home remedies include the classic vinegar and water with baking soda, or hydrogen peroxide, ammonia, or rubbing alcohol. Again, all these will have some affect in a lot of cases, but you’re not taking care of the problem, because the urine in essence, is still there. Avoid using ammonia-based products, as cats may identify it with the ammonia in their pee and make further messes in the same spot. Try using a citrus smell to “cover” up any remaining smell (if you opt not to use something like Kids n’ Pets brand to do the trick!). The citrus smell should deter cats from that location. Something that eats away and digests the odor causing bacteria. Remember, the best way to remove cat pee smells is the one that eats the stuff away for good! Once you’ve tried to disinfect the area, solutions with live bacteria may not be as effective and could require repeat applications. This is because the disinfectants will kill the “good guys”. Enzymatic-based cleaners for cat urine are designed to be like little armies, going in strong to combat the odor causing elements. You want them to have the first crack if at all possible.